ACMME2019 organizing committees invite you to submit your FULL PAPER / ABSTRACT for oral and poster sessions. ACMMEThe 7th Asia Conference on Mechanical and Materials Engineering (ACMME 2019). The conference will be held in	Tokyo, Japan during June 14-17, 2019. The conference aims to bring together world's best academicians, scientists, industrial experts, and research scholars from different areas of Mechanical & Materials Science Engineering to focus on emerging fields in these areas and provides opportunity for face to face interaction. Mechanical Engineering has major role in the mobilization and the economic development of the nation. It is one of the major employment generation sectors of the country. Mechanical Engineering integrates knowledge from different domains such as physics, materials science, manufacturing, thermal sciences and applied mechanics. Materials science engineering discipline has significant contribution for the advancement in the field of automotive, aerospace, naval, turbo-machinery etc. through the research on newer and lightweight materials with enhanced mechanical properties. Therefore, the recent developments in these domains always result in remarkable growth in nation building. All submissions will be peer reviewed by 2-3 reviewers. 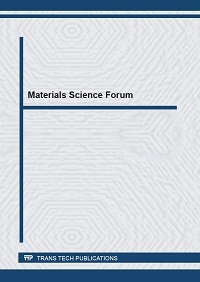 The registered and presented papers on Materials will be published into Materials Science Forum (ISSN print 0255-5476 / ISSN web 1662-9752), which is indexed by Ei Compendex, Scopus. The registered and presented papers on Mechanical Engineering will be published into Conference Proceedings, which is indexed by Ei Compendex, Scopus. Papers of ACMME2018, ACMME2017, ACMME2016 & ACMME2015 are indexed by Ei Compendex and Scopus! Selected papers from the conference will be reviewed for possible publication in the Journal of Materials Engineering and Performance. Each paper will be reviewed according to the policy of the journal.